Drop us a line and we'll be sure to get back to you in Just One More minute! I always like to say that JOM style is a relection of my personal style - Boho meets Prep! So it was only a matter of time before we added something with a Monogram! We are excited to introduce "Rose by Any Other Name"! This bracelet is So.Much.FUN… and so versatile! With all her options - you could buy one for all your gal pals and still never repeat a style! First you choose the base color. We have 14 different shades! Then you choose your font color - same colors as above (minus clear) plus Gold & Silver! Then you choose your font style. Named for Southern cities, we have 6 different options! Finally, you choose your beads. We have 5 different styles - a little something for everyone! Whether your style is glitzy, boho, preppy, or a little bit of all three - we've got you covered! 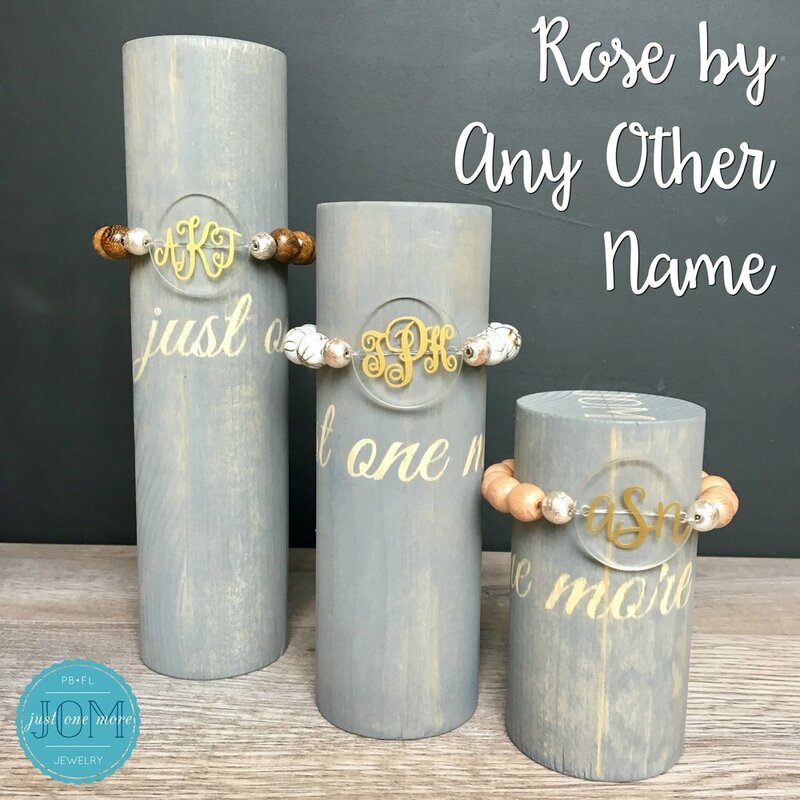 We're adding "Rose by Any Other Name" just in time for all your holiday shopping! You can buy a personalized gift for everyone on your list AND get a freebie for yourself! Read all about our Holiday Shoppers Delight and how giving to your friends can get you rewarded! There's a little something you should know about me... I was carrying hot sauce in my bag before it was cool. I am a Hot Sauce ADDICT!! I love a good Disney trip, for the obvious reasons, but also... you can find Texas Pete and Sriracha packets on the grounds. Panera Bread and Lion Country Safari are a good spot for Tabasco and my favorite doughnut store keeps me in Crystal packets. I may not be an old lady yet, but I can give your grandma and her Sweet 'N' Low packets a run for their money! So when trying to name this HOT new summer stack with a fitting cocktail name, I was at a bit of a loss. I wanted something Summery and also colorful.. but I was coming up with a bunch of dead ends. Until, my lovely Cocktail Connoisseur of a brother-in-law paid me a visit last weekend and introduced me to, the cocktail OF.MY.DREAMS. For those of you that are doubting me right now... don't knock it til you try it! It's incredibly refreshing and you can add as much or as little hot sauce as you like... It kind of reminds me of that diet cleanse with the cayenne pepper; I just imagine myself losing pounds while sipping 💁 We also added a little fresh mint for garnish, just because we had some around. Enough about the name already, let's get to the goods! Honestly, this has been my Go-To stack for accessorizing recently! White cotton shirt, white linen pants, Cajun Lemonade stack! Black silk top, black shorts, Cajun Lemonade stack! Not only has it been my accessorie du jour... I'll admit, it's driving my apparel choices! Who needs anything other than a blank canvas when you're rocking this arm par-tay!?! Can I please try just one? Okay! I'll take them all! 2018. JOM, LLC. All Rights Reserved.